A Perilous Undertaking is the second in the series of Veronica Speedwell Mysteries. I haven’t read the first but this book does enough to tempt me to do so. 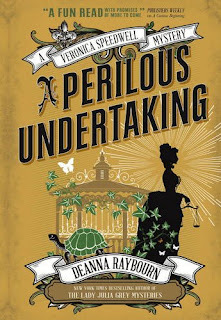 It also stands alone as Ms Raybourn manages to fill in any gaps that you might need to understand this story, for example how Veronica Speedwell and her male sidekick Stoker come to know each other. Speedwell is an adventuress and butterfly hunter. She’s not one for cliched (and not always accurate) Victorian pretensions. She’s a gung-ho, go get ‘em woman. Stoker is, of course, the scion of a noble family who is a man of liberal ideas. They’re a 21st century liberal’s idealised heroes. Whether it was necessary for Speedwell to also be the illegitimate child of a Royal Prince or not is moot. To me it smacks of over-egging an already eggy pudding. The story revolves around the murder of Artemisia, a model, muse and mistress of Miles Ramsforth, a posh patron of the arts. Miles is a friend of Princess Louise, one of Queen Victoria’s children and it is Louise that asks for Speedwell’s aid. Princess Louise is a fascinating (and real) person. The Royal Princess who did sculpture and who was part of the art world. If nothing else ‘A Perilous Undertaking’ drew me to ‘The Mystery of Princess Louise: Queen Victoria's Rebellious Daughter’ by Lucinda Hawksley. Princess Louise was involved in a mysterious death in real life. It’s a book worth reading. In fact, Lucinda Hawksley work seems to permeate ‘A Perilous Undertaking’ – see also her book on Pre-Raphaelite Muse Lizzie Siddell for some of the artistic background. I digress. The story rolls out nicely. Ms Raybourn can turn a phrase and, although Speedwell and Stoker are as artificial as hell, they move in a society that feels real. All the sexual peccadilloes and rumours that pop up in the book are part of the real Victorian England, which often gets swept away in the myths that have grown up about the Victorian world. Anyway, it rattles along. Its dialogue is both sharp and sounds right for the period, unlike another book set in the same-ish period that I read recently. Indeed, Speedwell and Stoker have a charming bantering relationship, although Speedwell normally comes out on top. Truth be told I really enjoyed it even when I was getting a little sniffy about some historical stuff (but only little things.) It’s a fun tale, told well with likeable leads. It’s funny and witty too, which I’m always going to like.